Another childhood game makes into way into the digital world as an app this month. Everyone has played the matching game that tests your memory by flipping over cards two at a time in hopes of finding a pair. Javier Sanchez brings this game to Apple devices everywhere with Match My Music !–only with a twist. 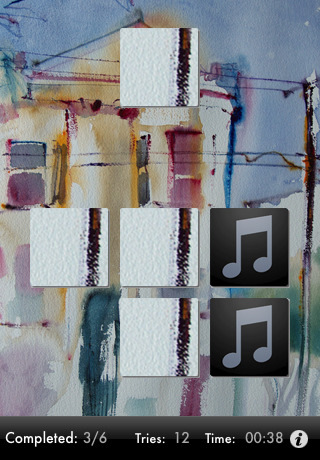 Instead of using photos on the cards, each one contains a sound clip taken directly from your music library. You can play alone or against a friend, but remember that the app will pull from the music stored on the device. The premise of the game is about the same as the original: match all the pairs on the playing field to win. Tap on a card to turn it over, and then tap another one to see if they match; you win when all pairs are cleared from the board. Instead of looking for the same picture, however, you’ll be listening to match segments from the same song. There are 5 levels in the iPhone/iPod Touch version, and each level gets progressively harder by having more cards. Each level is also timed, so you can try to beat scores if you’re competitive enough. If you have hundreds of songs stored, then best of luck to you. 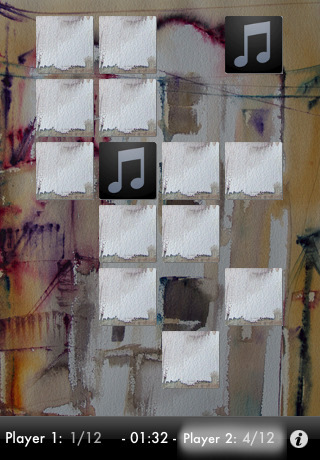 For an app based almost solely on sound, Match My Music has some amazing backgrounds. Such attention to detail (perhaps the most important detail, since no visual effects are required at all, and we are a visual species) is hugely appreciated by myself, especially after I found out that nearly all of the gorgeous watercolors are by a lesser-known artist, Fernando Arahuetes. App designs can go horribly wrong, so having an actual artist on board was a very smart move–the soothing backgrounds are strong enough to be perceivable, yet don’t distract from the game on hand. The twist on a familiar game is also a welcome surprise…it’s astonishing how much your aural capabilities take a backseat to your visual ones. Give this game $0.99 game a try if you don’t believe me. (To make things more interesting, play this game on someone else’s device, where you don’t know all the songs.) I do wish there were more levels, but perhaps that will be remedied in future updates. AppSafari review of Match My Music !- iphone version was written by Julie Guan on November 15th, 2010 and categorized under App Store, Fun, Games, Music, Music, Puzzler. Page viewed 4302 times, 1 so far today. Need help on using these apps? Please read the Help Page. Seems like a cool idea. Not sure i’d pay for this app though, I would definitely love to give it a try.